Houston Texans: Houston We Have a Starter | NFL News, as it happens, when it happens. Your one stop shop. The quarterback controversy is over, for now, in Houston. 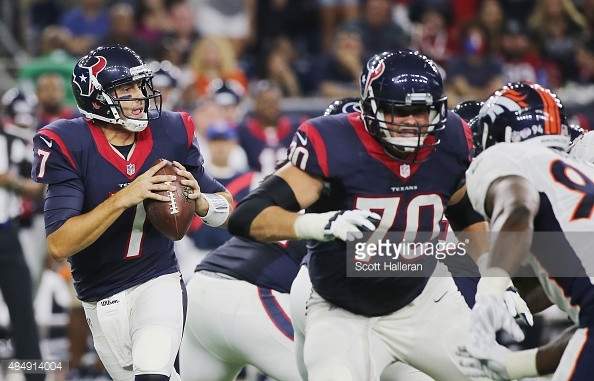 Yesterday the Texans named Brian Hoyer as their starter over Ryan Mallett. This was one of the few true quarterback competitions you’ll see. They both entered camp with a legitimate shot at the starting job, and neither seemed to have a leg up on the other skill or experience wise. This is not the first time these two have been linked. 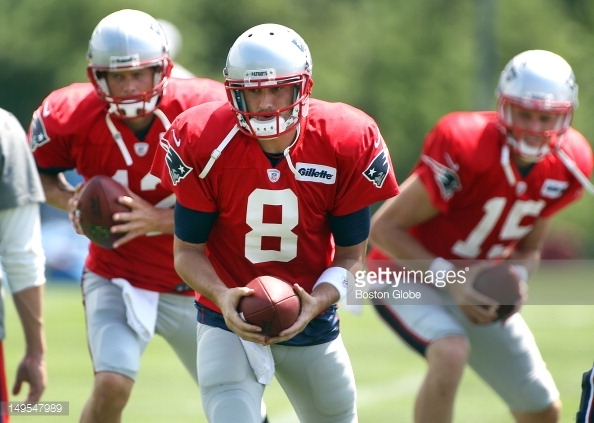 Hoyer and Mallett have both spent time as Tom Brady’s backup in New England. Hoyer was undrafted out of Michigan State in 2009, and he then signed with the Patriots. He beat out three other quarterbacks to be Brady’s backup. He remained in that role through 2011, but didn’t make the team the following season. Who beat Hoyer out in 2012? Why none other than Ryan Mallett. Mallett came out of Arkansas in 2011. For most of his college career, the 6’6 quarterback was regarded as one of the top quarterback prospects coming out of college that year, easily a first-round talent. Due to off the field issues Mallett fell to the third round, where the Patriots scooped him up with the 74th overall pick. Although he was the seventh quarterback selected in that draft, the Patriots regarded him as the best in the 2011 draft, and thought he was a steal in the third round. After stints with both the Steelers and Cardinals, Hoyer landed in Cleveland in 2013. Due to injuries Hoyer ended up as the Browns starter in Week 3, and played extremely well. After three straight starts, Hoyer suffered a torn ACL, ending a promising season. In 2014 the Browns named Hoyer their starter despite using a first round pick on superstar Johnny Manziel. Hoyer had some ups and downs through the first 13 games, and Manziel ended up replacing him. Johnny was far from impressive, and after an injury Hoyer finished up the season. He left the mess in Cleveland and signed with the Texans this offseason. Mallett spent 2012 and 2013 in Hoyer’s role as Tom Brady’s backup. However, in the 2014 draft, the Patriots spent a 2nd round pick on Eastern Illinois’ Jimmy Garoppolo. Before the season started, the Patriots sent Mallett to the Texans for a conditional 6th or 7th round pick. Mallett sat behind Ryan Fitzpatrick and Tom Savage before injuries allowed him to start Week 11. Mallett played well, but a torn pectoral a couple of weeks later ended his season. The Texans have been missing a quarterback since they gave up on Matt Schaub. Last year proved, they’re a good team, but they didn’t have a reliable quarterback. The roster is loaded. The defense is one of the best in the league, led by the league’s best defensive player, J.J. Watt and linebacker Brian Cushing. They just added Vince Wilfork to be a run-stopper in the middle. Offensively they’re skilled too, with talented guys like Arian Foster and DeAndre Hopkins. All they need is a quarterback. The situation is looking better than it did last year. Hoyer and Mallett have both had success in the league, but haven’t really had a full workload. 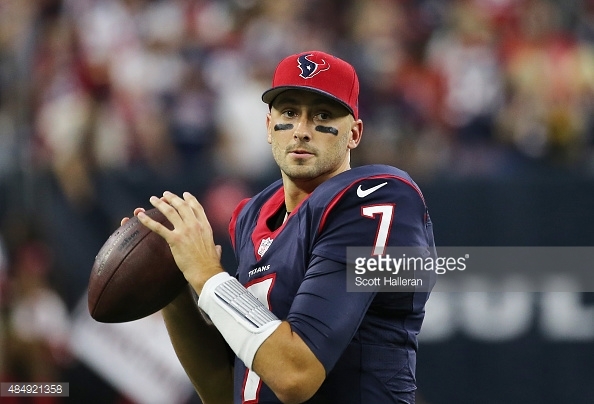 If Hoyer proves to be good enough, the Texans could be a scary team this year.